Clean and protect your silk flowers with Simply Silk. There are a lot of different silk plant cleaners on the market today, and a number of ways to clean silk flowers without using a commercial cleaner. Over the years, I’ve tried many things, but my all time favorite way to clean my silks is using Simply Silk. Simply Silk is sprayed onto the silk, then removes the dust as the excess drips off. It can be messy, but there are ways to minimize the mess and make clean up a breeze. I’m going to share what I’ve learned so you can get the most out of your bottle of Simply Silk. Getting the word out about Simply Silk, we put together a short video. Check it out! 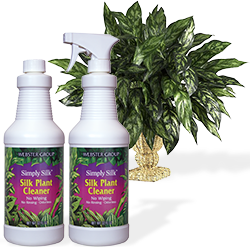 There are a lot of silk plant cleaners available. Some are easier to apply, some are easier to clean-up, some are easier on the environment, and some are chemical free. At the end of the day, though, it all comes down to personal preference. Simply Silk in the tub or shower. Simply Silk works by over-saturating the fabric, allowing the dust to become suspended in the excess liquid. As the liquid drips off of the petals and leaves, the dust drips off as well. The tips of the leaves and petals should point downwards as leaving the item upright can cause the dirt and debris to collect at the base of the leaf or petal. Relatively small silks–such as single stems, arrangements, “bunches” sprays, and garlands–can be suspended over the floor of your bathtub or shower stall. I use two suction cup hooks to suspend a heavy twine across the length of my tub. Small bunches and some arrangements can simply be hung with about half of the florals on either side of the twine. I use ordinary clothes pins to secure lightweight stems and garlands in place. Some arrangements will need to be carefully disassembled, each stem cleaned separately, and then reassembled. While this is usually true of large arrangements, you may want to disassemble any arrangement that mixes dried flowers with silks. Saturate each leaf and petal evenly until the solution runs off and let air dry. Once the treated silks have dried, it is a simple matter to rinse the tub or shower to remove the run-off. What If The Dust Is Really Thick? Have you put off cleaning your silk flowers for too long? 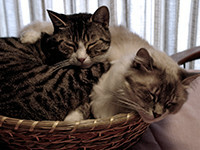 We have lots of pets, which translates into a dusty environment. Not to mention fur everywhere when they’re shedding! For us, cleaning the silks once every three months is really necessary. For you, a good cleaning once every six months, even once a year, may be just fine. But what do you do when cleaning is long overdue? Shake off as much dust as possible. Blow off the dust using an air compressor set to low pressure. 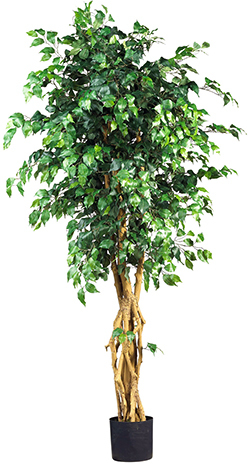 What About My 6-foot Ficus? It definitely won’t fit in the shower. Some of the more dramatic silk plants are too large to clean in the tub or shower. Like a large houseplant grouping, or a 6-foot Ficus. I clean larger items in the garage. Using twine, I suspend the plant from the ceiling so that most of the leaves on the lower side point down and the base is higher than the crown. With a thick layer of old newspapers underneath to catch the run off, I apply Simply Silk to the lower third of the plant (or quarter, if the plant is really bushy) and let the silk air dry. Rotating the plant each time, I repeat this procedure until I’ve cleaned all three (or four) sections. To clean up, I put the used newspapers in the recycle bin! Where Can I Find Simply Silk Locally? The single most frequent question I get. As far as I know, Simply Silk is no longer available in retail stores. In a recent conversation my Sales Rep told me I am their only reseller still purchasing Simply Silk! To place an order, visit SimplySilkTM.com.